OTTAWA - A contract to replace Canada's aging fleet of jet fighters won't be finalized until at least 2018. The Harper government has released its long-anticipated defence acquisition guide, which is meant to provide industry a snapshot of the military's expected equipment needs over the next two decades. Defence Minister Rob Nicholson recently notified defence contractors that the guide, which contains some 200 different pieces of kit, is not a commitment to buy and that it's meant to start a dialogue with manufacturers. The guide says the replacement program for the CF-18s will remain in the definition phase between 2015 and 2017, meaning a decision could be pushed out past the next federal election, slated to take place in less than 18 months. There will be a request for proposals between 2017 and 2019. It goes on to say the awarding of the contract is expected between 2018 and 2020, which is around the time when many of the CF-18s are expected to reach the end of their service life. 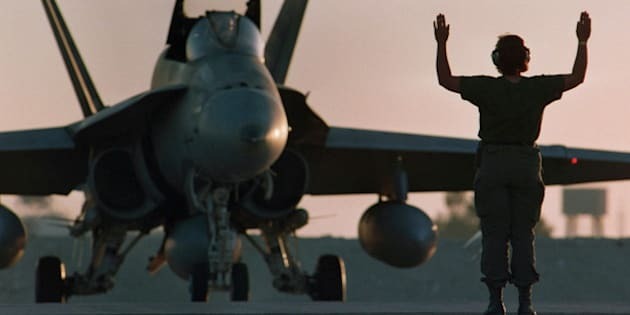 The guide also proposes upgrades to the CF-18 electronic warfare suites, as well as software and training improvements for the fighters, originally purchased in the 1980s. What that means for the fate of the controversial F-35 program is unclear. The federal cabinet is examining a series of reports, including an independent panel's market analysis of which fighter aircraft could meet the future needs of the air force. It could decide over the next few weeks to continue with the stealth fighter plan or throw the replacement program open to a full-blown competition. Another option might be for cabinet to ask the air force to rewrite its statement of requirements. The federal Liberals are taking the guide as a sign that there will be a competition. Defence critic Joyce Murray called on the Conservatives to guarantee that the Prime Minister's Office will allow open bidding, and not overrule the plan. "Great news today from the Department of National Defence," Murray told the House of Commons during question period. But Public Works Minister Diane Finley, whose department is overseeing the troubled program, warned against reading too much into the timeline, saying no decision has been and likely won't be any time soon. "We've had an independent panel of outside experts review the assessment that was done by the RCAF," Finley said. "Over the next several weeks we are going to be carefully reviewing a number of reports on this subject, so that we can make sure that we get the proper equipment our men and women in uniform need to do their job." It's not the first time the 2018 date has been floated in relation to the fighter replacement. Earlier this year, the manufacturer of the F-35 indicated that the Harper government had pushed its potential delivery date for the first aircraft off until that year, holding its place in the line of countries that have already agreed to buy the jet. But Steve O'Bryan, vice president of business development at Lockheed Martin, said in order to meet the timeline, Canada would have to make a decision and begin making payments next year. The federal government has not signed a delivery contract, but the partnership arrangement among nations requires them to put begin putting money down three years before the first plane arrives.